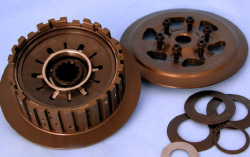 The Champion´s Slipper Clutch Technology designed by Suter 1996! The SuterClutch - precision machined from T-6 aircraft quality aluminum-is a slipper cluch specially developed for motorbike racing. It leads the field of slipper clutches thanks to a new and revolutionary mechanism. 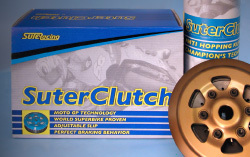 The SuterClutch Slipper Clutch offers better running characteristics and smoothness across the entire range. No more rear wheel hopping, easier controllable slides and a smoother, more precise response result in improved stability during braking, a better steering behaviour and hence faster lap times. Riders will immediately notice the benefits of this slipper clutch, even if they are already quick. 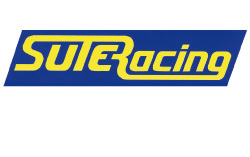 In racing - On - and Off - road - the SuterClutch is considered by professional biker around the world as one of the most crucial Powerparts. Super-Moto, Moto-Cross, Enduro, Supersport and Superbike. Aprilia, Ducati, Honda, Husqvarna, Jawa, Kawasaki, KTM, MV-Agusta, Suzuki and Yamaha.